Synchronize your Palm and Mac with full support for national characters! Do you write on the Mac and the Palm in your language and need your data to be transferred correctly? Does your Palm display “<String is unprintable>” or question marks instead of important information? Would you like to read text from your Mac on your Palm? With Palm Encoding Setup and Palm Doc Converter you will finally be able to correctly synchronize data with national characters between your Palm and Mac. 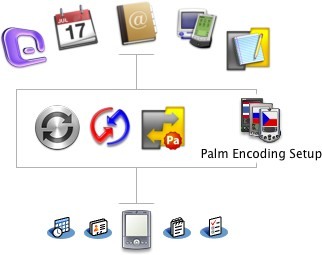 Palm Encoding Setup is compatible with Apple iSync, Palm Desktop, Microsoft Entourage, Mark/Space Notebook (or the older MemoPad) and other Missing Sync conduits and independent on your synchronization software (HotSync or Missing Sync for Palm OS). 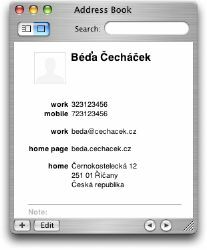 It allows correct transfer of data containing national characters between all applications supported by this software, for example names and addresses (Address Book) or memos (Memo Pad) in your language. 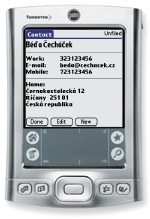 The application is compatible with all common encodings (Central European, Romanian, Baltic, Cyrillic, Greek, Turkish, Arabic, Hebrew, Traditional and Simplified Chinese, Japanese, Korean, Thai and Unicode see details), which are used in software localizations for Palm OS handheld computers. PDAs with other operating systems (Windows Mobile, used by Palm Treo 800w, or WebOS, used by Palm Pre) are not supported. Once the application changes the encoding, which the synchronization software uses, it does not interfere with the synchronization itself or the functioning of the system. Therefore it doesn't affect the performance or stability of the system. Palm Encoding Setup is very easy to use. You receive a manual with the application, which will guide you through the installation and first synchronization. The following synchronizations will run as usual. The manual also contains solutions for possible problems and will help you choose a localization for your Palm (some are free) if you do not yet have one. Everyone who purchased a copy of Palm Encoding Setup, contributed one dollar to the Schools for Africa project organized by Člověk v tísni (People in Need), a Czech charity organization. The collected funds helped build elementary schools in Ethiopia, where less than half of the children can attend schools. (See more infomation in Czech and English.) Thank you. I do not plan to release any updates for Palm Encoding Setup and Palm Doc Converter. Both applications can now be dowloaded and used for free, and both still work on the current version of Mac OS X. Now seems to be a good time to do this as Palm OS is effectively outdated by two generations (Palm OS and webOS). It's kind of sad to see another great mobile UI created by Palm go. Mac OS X 10.4.x or later. A Palm OS PDA. Windows Mobile or webOS PDAs made by Palm, such as Treo 800w or Palm Pre are not supported. For the solution to be complete, we have developed an independent freely distributed application Palm Doc Converter, thanks to which you can convert, create and edit electronic books for the Palm in an encoding of your choice. Údaje vyžadované ze zákona: Adam Nohejl, Milady Horákové 415/6, 251 01 Říčany, Radošovice, IČ: 71507485, DIČ: CZ8610300017. Jsem fyzická osoba podnikající zapsaná v živnostenském rejstříku vedeném MÚ Říčany pod č. j. 60691/06, ev. č. 320903-23760-00.